- He considered La Floridita, the old Havana bar that served him countless daquiris back in the day, one of his favorites. (He's seen below throwing back one of these said cocktails with Spencer Tracy in 1955). - He was known for buying stuff from Abercrombie (including the fateful shotgun). 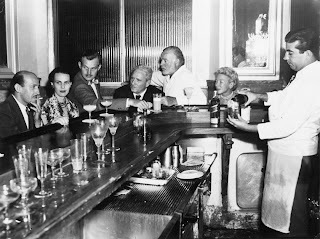 - On the other hand, though, the folks at La Floridita have not let the lore of Hemingway's patronage fall subtly into history. The joint has a statue of the guy sitting in there today, so it's no stretch to imagine that this is actually just a nice piece of touristy memorabilia, a luxury version of a Hard Rock Cafe t-shirt. (However, I couldn't find others online). If the fact that it might have been Hemingway's at one point makes it more interesting to you and you've got nothing to say that it wasn't his then why not just say that it was his. 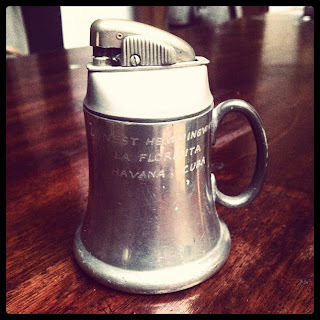 If you appreciation of it derives from the fact that it is a cool antiquey lighter then why not just accept it as a cool antiquely thing and not worry about who may have owned it in the past. The real value of Hemingway is his writing and you can get that for free in the library. michael's point is valid, but the fact that Hemingway owned such a beautiful antique lighter just makes something already great, awesome. Hollister I would like to think that yes, it was Hemingway's! What is your favorite of his books. A Moveable Feast is mine. Mine is "The Sun Also Rises" and with respect to whether the lighter was Hemingway's or not,"Isn't it pretty to think so?" Find a good psychic and take it to him/her! Oooh...worth a shot, non? What do I think ... ? Replace the flint, fill it, & then film it in action, dahlink. A Hovey video instalment is in order. Maybe The History Detectives on PBS could help? They seem to specialize in tracking down the backstories to mysterious curios. They researched the origins of a single World War I Siberian bullet. The the old saying 'if it's too good to be true, it probably is' comes to mind.